The freezing temperatures are suppose to end soon. Today's high should be mid 50s, and then just one more night of below freezing temperatures. A welcome break from freezing all weekend. I watched all four NFL playoff games. The only game that had any excitement was the Green Bay vs. Arizona game last night. In the Eagles/Cowboys game, Romo looked great and McNabb looked old. Do you think they can get 50,000 in Cowboys Stadium for a boxing match? Bob Arum and Jerry Jones think so. The Terrell Lady Tigers are home Tuesday night against Red Oak and on the road Friday night against Mesquite Poteet. The boys are on the road Tuesday against Red Oak and home Friday night against Mesquite Poteet. I am already tired of politics and the "season" is just beginning. The Warrior Dash in Forney on May 1, 2010 sounds like fun. Not to compete, but to photograph. Jay Leno moving back to late night is fine by me, I won't watch him there either. This looks and sounds unappetizing. Like something you would make at 2AM after getting home from a night out and you have nothing in the fridge. It sounded good while you were making it, then you wake up and see it sitting on the table with one bite gone, yuck. 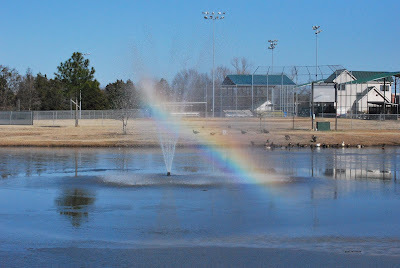 A Monday Bonus later today, and join the Terrell Daily Photo Facebook page for more weekend pictures from Ben Gill Park.